Well, Butterfly is complete and as I'm sure you can tell -- I had a problem. Yep, the sleeves are too darn long. Now I measured as I went along and I *swear* they grew during the second blocking. Now, I kind of like them turned up and Pete thought the looked good that way too. What do you think. Be honest! I thought maybe I could *gasp* cut the sleeves and graft them back together, but that sure does seem like a lot of work. And it also seems a little dangerous, if you know what I mean. On a happier note, Butterfly is warm and cozy! I think I'll be wearing this sweater a lot this fall. I had my eye on the DSC-T1 until Pete read a review in one of his photo magazines for the W1. After he read it, he told me to get it. I am very -- shall we say -- frugal. In an uncharacteristic display of reckless spending, I bought it! I've needed a new camera for my business, so it's not so reckless I suppose. Time to go watch the debates! 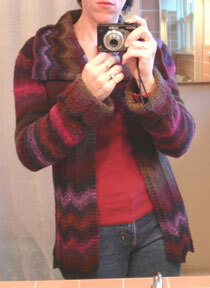 Look what I finished seaming over the weekend! I have to say that I really had a fear of seaming before this sweater. I haven't made that many sweaters and the seaming on the ones that I have made have not looked as smooth as I would have liked. Thank goodness for The Purl Stitch by Sally Melville. The pictures in this book are so clear and easy to follow that I had no problem figuring things out. I highly recommend this book. I'll have to show you a close up of my seams after Butterfly is dry. I am really impressed with myself :) This is why I love knitting. I've been knitting since I was about 8 or 9 and here I am learning something new 25 years later! In other knitting news, I was able to visit a yarn shop that I had never been to before -- Sunflower Samplings in Crystal Lake, IL. I was really impressed with this shop! They had the latest yarns from Rowan, Noro, Debbie Bliss and many more. They even had Jane Ellisons newest book -- The Queensland Collection. Now, I have fallen in love with Jane's designs, so I knew that it had to come home with me. . . I bought an entire bag of the yarn you see there. It's called Kathmandu and it's 85% Merino, 10% Silk and 5% Cashmere. Yummy! This stuff is so soft and lovely! It's also wonderfully tweedy, which I'm not sure it readily apparent from my picture. But here's the sad part. This is Kathmandu ARAN and I needed Kathmandu DK to make the Agatha Cardigan (Click here for a picture of it). *sob* I was all set to start the cardigan on the car ride home since I had finished the seaming of Butterfly during the car ride. Now, I know that this is very new yarn and the shop owner's didn't realize that they sold me the wrong thing, so I am not upset with them. They were very nice and I'm sure if I called them, they would let me return it. However, I have fallen in love with the yarn and I think that I'll have to keep it. (This is how a yarn stash expands.) There is a gorgeous scarf that is kind of wrap-like called the Annie Scarf that I might make with it, but I need to find some of the Soft Comfort Kid Mohair. Hopefully Butterfly will be dry by tomorrow so that I can sew on the eyelet and take a picture for the gallery! Look at the great stuff that my Secret Pal sent me! There is a cute beaded scissor fob that I already have on my scissors. 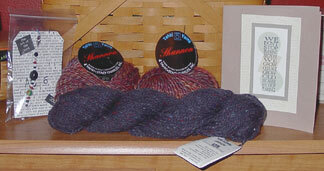 Then there are two skeins of Shannon by Tahki and a hank of Classic Elite Devon. Very pretty! And of course another handmade card. Thank you so much Secret Pal! I want to play with the Shannon right now. I love the colors. And I also got RAOK'd! Carolyn sent me a super cool Scrabble stitch marker. The funny thing is that I'm a Scrabble junkie! I play online every day. I've even read Word Freak by Stefan Fatsis (great book, btw). Thanks!! Did you think. . .
that you would stop by my blog today to see my completed Butterfly? I'm afraid it's not quite ready. I do have some news though. I did a nice three needle bind-off on the sleeves and then picked up the stitches for the collar and started knitting away. The collar is quite large, so I'm sure it will take me a few days to complete it. Which brings me to an important note for all you Butterfly knitters!! On the Collar, after you have picked up the stitches do not purl 1 row but continue straight with the 1st row. I didn't see any errata posted on her website yet, but I'm sure it will be there soon. 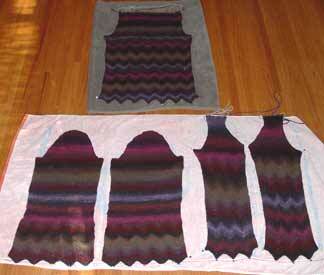 She also mentioned that there is a stitch difference if you are doing one of the two largest sizes. She knew I was making the small, so she didn't elaborate, but if you are making one of those sizes, I would drop her an email or check her site! I found it at Rapt in Maille's booth. It's made out of stainless steel I believe, so it was pretty reasonably priced. I just love it! Tune in tomorrow for pictures of gifties!! I'm afraid that I don't have much else to say today. I'm still having a lot of pain in my ear/neck and had to endure a cortisone injection on Monday. (It doesn't really seem to have helped -- grrrrr.) So, I'll just leave it at that. Okay, so it's not a couple of sleeves yet, but it will be before long. I cast on for the sleeves last night and as you can see, I decided to do two at once. Now here's a tip, one that I can't take credit for, that makes things much easier. Janice left a comment yesterday recommending that I pin my sleeves together so that I will remember to knit across both sleeves. I've knit two sleeves at the same time before and this is a constant problem. I wasted so much time trying to figure out which sleeve I had just knit when all I needed to do was pin them together. Thanks Janice! One more comment on the sleeves. You will notice that they are matching. I didn't match the fronts of the sweater, but I did decide to match the sleeves. Luckily I had two skeins of Kureyon that started in the middle of the same color, otherwise I'm sure it would have taken a lot of troublesome matching. Luckily I have the swift and ball winder! Hopefully I'll have some finished sleeves by Monday! 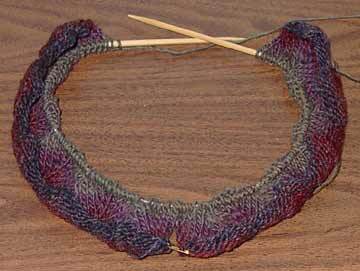 Never start a new piece of knitting while sitting in a waiting room in a hospital. I thought the knitting would relieve the stress, and I guess it helped a little, but I ended up ripping all my work. Actually it's worse than that. 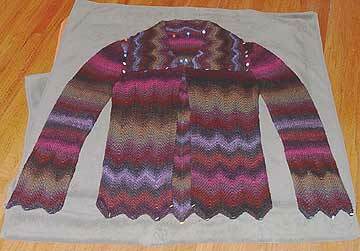 I started the right front of Butterfly, but ended up knitting the left side again. I was so flustered after being injected with dye and having photons shot through my head that I didn't realize my mistake until late Friday night after I had knit somewhere between 6 & 8 in. (I didn't have the heart to measure.) But enough whining. I give you the right front. . . It was a very busy weekend, so between having to rip all that work out and then having very little knitting time, I didn't finish this piece until about 15 minutes ago. Next comes the sleeves! Yeah! I'm looking forward to starting them. I'm toying with the idea of doing two at the same time. I'm planning to cast on before the day is out, so I guess I better stop toying and start deciding. I'm having fun with Butterfly, but I'm starting to get eager to work on a new Black Sheep Bags design again. I have the Heidi Tote design almost finished. I just have to write up some changes and knit a couple of test bags. I may have a new pattern ready to go before the end of September! I don't get as much knitting time during the week, but I was able to finish the first front piece of Butterfly this week. The pattern continues to appear to be error free and I receievd a couple of nice emails from Jane Ellison! There is no errata yet, but she will post one on her website -- www.janeellison.co.uk -- if one becames available. Although with the high quality of the pattern so far, one may not be necessary. How refreshing! In other news, I'm leaving soon for a CAT Scan. I don't think I'll mind the actual test, but I'm not sure about the results. I mentioned my TMJ diagnosis a while ago, but it now appears that may not be the problem. So frustrating. Wish me luck! Knitting Blogs Web Ring Breaks 500! Whoa! There are now over 500 sites in the Knitting Blogs Web Ring. It sure has been a lot of work getting to this point -- hundreds of hours of work! (And all unpaid, I might add.) I'm closing the ring to new members for a while, but I've decided that I will re-open it at some point. My volunteer work for C.O.P.E. (Cat Overpopulation Planning Endeavor) will be starting up again soon and I want to volunteer at the Will County Democratic Organization too. Oh yeah -- and I need some time to knit, right?